The National Infrastructure Commission provides an independent high-level view of significant infrastructure projects. It is led by Lord Adonis and has recently published a report on transport in London. The Commission published two reports on the same day. The first is the commission's opinion. The second is an independent report drawn up by consultants. This section examines the commission's report. The commission report is relatively simple. The Commission concludes that the strategic case for Crossrail 2 is well founded and recommends that it is taken forward. It is not a substitute for smaller scale improvements, but these alone will not be enough. * Provide vital relief for the congested southern end of the Northern Line and for the Victoria Line through north-east and central London. These are forecast to see much of the highest levels of crowding anywhere on the Underground, after the opening of Crossrail 1. * Provide an alternative route, via its connection to Crossrail 1, from southwest London to the City and Canary Wharf, reducing passenger numbers on the overcrowded Waterloo and City line and the eastern part of the Jubilee Line. * Relieve capacity constraints on the critically over-crowded south-west London commuter lines coming into the capital through Wimbledon, Clapham Junction and Waterloo by providing an alternative route for inner suburban services via a new tunnel from Wimbledon into Central London. * Reduce terminal congestion at the UK’s busiest station, Waterloo, as well as cutting crowding levels at Clapham Junction, Vauxhall and Wimbledon, all of which are forecast to face insuperable operational difficulties due to the volume of passengers at peak hours. * Release capacity on the existing south-west network for longer distance services from Basingstoke, Woking, Guildford, Southampton and beyond. * Provide four tracks on the West Anglia Mainline to enable faster services on the London-Stansted-Cambridge Corridor. * Link with Euston/St Pancras, to provide onwards dispersal for those arriving into London from the north on HS2, which is planned to be completed to Manchester and Leeds in 2033. * Stimulate new housing, jobs and development along the whole route. In particular the line will transform access to the Upper Lee Valley Opportunity Area – one of the largest in London. * Establish a turn-up-and-go level of service at a range of underserved destinations allowing for regeneration around transport hubs in Hackney, Haringey, Enfield and Tottenham. * Unlock 200,000 homes, provided the right planning framework is applied. It is interesting to note that the first item is relief of the southern section of the Northern line (not the Victoria, Jubilee or Piccadilly). Regular readers known my scepticism of this claimed relief. The costs of Crossrail 2 are high and therefore every opportunity should be taken to improve its affordability. * The updated case should include detailed options to reduce and phase the costs of the scheme. The most promising option identified to enhance affordability would be to delay the construction of the northwestern branch to New Southgate. This could reduce the costs of the initial scheme in the 2020s by around £4 billion. More work should also be done on the costs and benefits of individual central London stations. * If construction of the north-western branch is delayed, this would also provide the opportunity to consider the case for an eastern branch from Hackney as an alternative. All in all, there is nothing particularly surprising about the commission's report. It says lots about finance, housing and growth. And on Crossrail 2 itself, it backs the official scheme almost in entirety, the main exception being the possible dropping of the New Southgate branch. The second report is from independent consultants. It is much more interesting in the ideas presented, however it cannot be seen as the commission's opinion. Nevertheless, it is worth summarising some of the key ideas mentioned in the report. In the North, the second report also discusses dropping the New Southgate branch. (This may be where the commission got the idea.) However, dropping the branch is not discussed in isolation. Instead, the report proposes investigation into a "cost effective cross-London route" from Moorgate to Waterloo. The map shows the proposal in red, with the dropped Crossrail 2 branch to new Southgate in dashed blue. The proposal is to take the existing National Rail services from Hatfield, Welwyn and Hertford to Moorgate through a new tunnel to Waterloo and beyond. Potentially this may need only two new underground stations - Cannon Street and Waterloo - although it is more realistic to also expect Moorgate may require a rebuild. 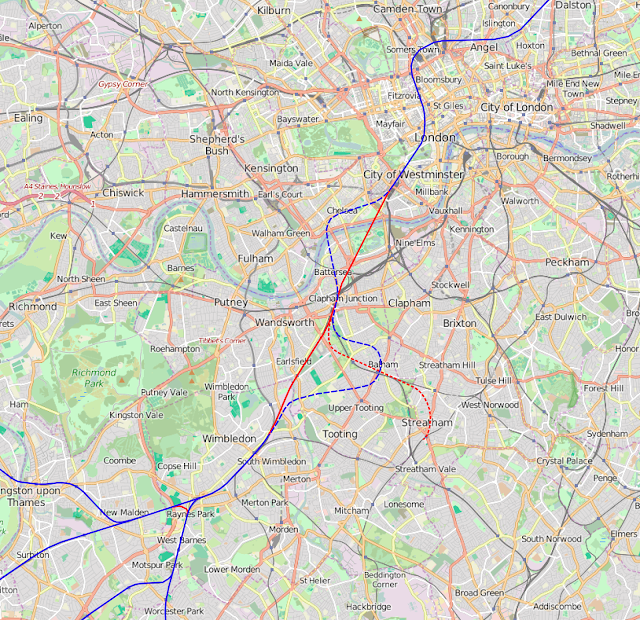 Beyond Waterloo, the proposal is to take the line to the Battersea area, and beyond. This is a sensible proposal, very similar to Swanlink. Construction would however probably require some lengthy closures of the line from Finsbury Park to Moorgate. It is likely to be relatively cheap, with minimal tunnelling and few new stations. In zone 1, the second report enthuses about an extension of the DLR from Bank to Euston/Kings Cross, with closure of Tower Gateway. Such a scheme would be well used, but whether it is the best option is a different question. In the east, there is discussion of a north-south line from Stratford to Lewisham via Canary Wharf. This is similar to the Sussex relief line proposal. There is little detail however - it is little more than a couple of sentences. The next section discusses phasing, including the rather impractical suggestion of only building Victoria to Euston. In another section, thoughts turn to changing the specification of Crossrail 2 to an automated metro with dedicated access to tracks. This would require there to be no services from the southern branches to Waterloo. Undoubtedly, this would simplify operation, and raise the potential of 40tph (perhaps of shorter trains). However, it seems that it would be tricky to get the segregation necessary. The report then discusses increasing the scheme benefits. Here the report argues that Crossrail 2 leaves Earlsfield "stranded", and that a branch to Balham and Streatham would makes sense. This is essentially the argument I made in the Swirl-Max plan. In an ideal world, I remain convinced that Swirl-Max servces southern Wandsworth better than the official plan, with an expectation of more Northern and Victoria line relief. If money is tight, then Swirl remains the better option. Finally, the report suggests a link from Motspur Park to New Malden, shown in red on the map above. This link, potentially funded separately from Crossrail 2, would allow through services from Epsom and Chessington to Kingston and Twickenham. This would effectively be orbital, rather than radial travel. This seems very sensible, and potentially allows the frequency on the Epsom and Chessington branches to reach a more sensible 8tph rather than the currently proposed 4tph. It is easy to get carried away when reading the second report, as there are lots of potentially great ideas in there. However, it is only the report of consultants, not the report of the commission itself. And the commission's report is very bland, backing the existing plan almost in its entirety, Although it does look like the New Southgate branch is for the chop. That said, it is great to see a tunnel south from Moorgate, and routing Crossrail 2 via Earlsfield with a branch to Streatham in a key document. While it may come to nothing, it is at least a marker for the future. Finally, it is clear that residents in Merton looking to reduce the impact on Wimbledon and Raynes Park need to continue arguing for a "fast line tunnel", as it is still the only option that will make a significant difference. And residents in the London/Surrey borders should continue to argue for a routing via Earlsfield to avoid their services being slowed unnecessarily. I have followed your proposals with interest and have been convinced that your SWIRL route, in the southwest, should be the preferred route. Are you making any progress? Are people listening to you? The concept of a "fast line tunnel" (aka Swirl) is now relatively widely known in local politics. If everyone keeps repeating "fast line tunnel", there remains a good chance of getting it (especially if it is cheaper). Dropping New Southgate allows the Lea Valley portal to be further south (east of Clapton) where there are potential depot sites near Lea Bridge. Also, there is the potential for CR2 to serve the Chingford branch, which would free up Liverpool Street paths. David Deakin candidate for London assembly said at a South ridgeway association meeting last night that because the two rail operators don't talk to each other, and neither apparently do Cross Rail 1 and Cross Rail 2 there is in his opinion absolutely no chance of your brilliant idea of "fast line" tunnel because it's on the other teams territory. In his opinion it could just never happen. It was interesting what he said about Raynes Park - need to reposition station due to platform length needed etc. He also was in favour of going north at Wimbledon ie towards Alexandra road. See my latest post http://ukrail.blogspot.co.uk/2016/03/crossrail-2-and-merton.html to understand why "demolish the north" is little different to "demolish the south" in terms of the impact on Wimbledon and Merton. We know that there has been some investigation of the fast line tunnel, what we don't know is whether the two teams (TfL and Network Rail) are working more closely that they did before the consultation. At the very least, it will have to be properly evaluated to avoid the risk of Judicial Review. I have read many times about ideas for going south from Moorgate but the counter arguments have always convinced me it is not going to happen. 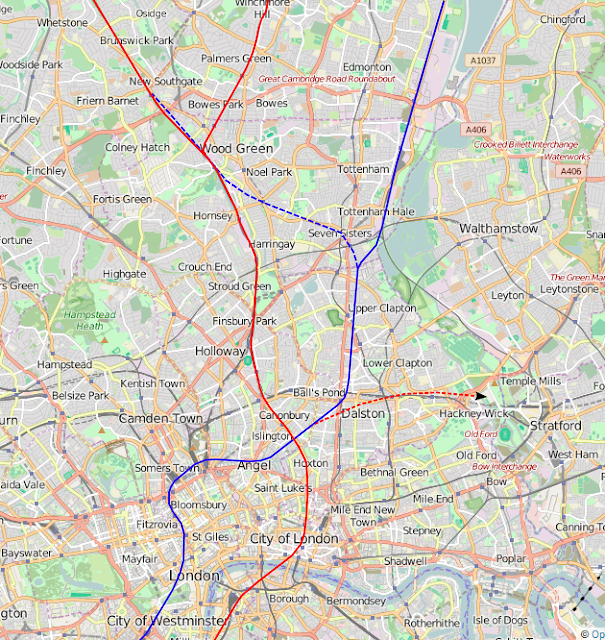 However, I would consider a route that 'branched' off the Northern City around Essex Road, to Clerkenwell [underserved and if built around Mount Pleasant development could link to circle line], Chancery Lane (central line), Aldwych [re-opened with people mover to Holborn] and Waterloo. My problem with a route via Clerkenwell (which is indeed underserved) is that it means the line would have no station to serve the heart of the City. That seems unwise given the existing users of the line would be thus have a disbenefit (which makes BCR harder to achieve). Building some sub-surface platforms at Euston for suburban services makes sense, however building the Crossrail 1 link at Old Oak Common probably makes more sense, and is cheaper. Having lived all my adult life 5 mins from Hornsey station, it would make sense to try and get 'metro' services on this line ... I understand one of the limiting factors of the current line is the turnaround at Moorgate but what else stops it? Hi Stephen, thanks as always for you analysis. Re the Chessington/Epsom to Kingston services, would the 8 tph be made up up 4 tph Crossrail 2, and 4 tph to Twickenham/Kingston, or would all 8 tph be for Twickenham/Kingston? Re the Chessington/Epsom to Kingston services: would this be feasible now, before the advent of Crossrail 2? Both in terms of having available capacity, and any rough guide as to the potential cost. I would envisage the idea in the report being 4tph to London (CR2) and 4tph to Kingston. Chessington passengers could change from a Kingston service to a London service at Motspur Park. However, there is property and school demolition to build the link to consider, and possibly moving a main road. It is very hard to judge the price, but I don't think it would be cheap (probably a fair bit less than £1bn). Given that a similar transport result could be achieved by changing at Raynes Park, it would be hard to justify I suspect. I happen to think it is a good idea, but probably fairly unlikely in practice. The additional frequency on the CR2 branches would certainly be useful, particularly if 50K+ houses are built beyond Chessington. Like you Stephen, I am a Crossrail enthusiast, and have analysed and mapped my own potential routings as well. I proposed a similar route shown to the Moorgate-Waterloo tunnel, instead skirting round the east of Bank and calling at Liverpool Street before branching up with the NCL at Essex Road. It would be more expensive, but it would avoid the Crossrail station at Moorgate which blocks the NCL, as well as the Waterloo and City further south. I am not overly concerned about what route e NCL extension would take south of Moorgate. It is not even certain that the Crossrail shafts really do block the path of an NCL extension. While routing via Liverpool Street is fine, so would a new station under Queen Street near Mansion House, or to link into Cannon Street. There are lots of options, and going to Waterloo is only one (although it does relieve the Waterloo & City, which is hard to do in any other way). Got to observe though, that if Essex Rd was built then it, Angel and Dalston would all be very close to each other. Interchange is important but if so something's got to give I would think...?